Could teamwork be destroying your company? 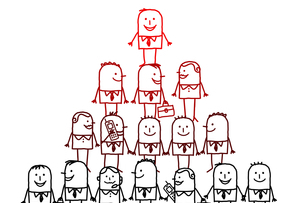 The old 'vertical' style of working is crumbling in favour of a horizontal hierarchy, made up of 'teams'. But is this a brave new world for companies? Or could this be really, really bad for business? As we increase the number of connections across the organisation we can easily slow down decision-making, pile on more meetings, increase costs and reduce engagement. People in complex companies are members of an average of five teams and spend two days a week in meetings where 50% of the content is irrelevant. That’s 20% of our professional headcount or nine years of a typical career wasted in unnecessary meetings. One problem is our unthinking attachment to teamwork. Many companies run team-building programs, and have teamwork as a corporate value. They recruit, develop and promote people for their ability to work in teams. To be accused of 'not being a team player' is a kiss of death for your career. But in a complex environment teamwork becomes more expensive and difficult; we have more diverse groups of colleagues in multiple locations, time zones and complex organisational structures. A face-to-face meeting for a global team can cost hundreds of thousands of pounds and someone will always be awake in the middle of the night on a global conference call. · Spaghetti teams - three to six people collaborating synchronously and intensively on a task requiring complimentary skills – for example, multidisciplinary problem-solving. · Star groups - hub and spoke structures suitable for coordinating a number of people with similar skills and roles – such as a group of salespeople reporting to a sales manager. · Cloud communities- up to 50 people who share a common identity and work together to advance the interests of the community – for example, a functional community or a community of practice in a particular topic. Each of these forms of cooperation are suitable for delivering varying goals but they need to be set up and managed differently. In complex organisations we need to understand that teamwork is only one way of working and in fact can become a complex and expensive way of getting things done. Don't forget to consider empowered individuals and loosely connected groups – they often get things done faster and deliver a better result.